On a chilly evening of the 11 February, 5 brave actors tackled a tightly spiraled granite staircase down into a vaulted cellar in Lostwithiel. There, they were greeted by myself (Russell!) and Mike from Gydeline and they entered the recording studio. Hanging from the ceiling, on one of my finest woodworking constructions, was a solitary microphone. A script lay ready for reading on a piece of board sat atop a projector stand. This all may not sound impressive, but it worked… and that’s what counts. The journey to this recording was harder and longer than we thought. Based on an idea that you can learn a lot from other people’s mistakes we decided, last September, that a podcast was to be born. We concluded that creating a spoof company whose approach was deeply flawed was the way forward. Sydeline was born by cleverly switching “G” with an “S” from our own company name. Why did we take this approach? Because many of the stories we tell are based on real life and we didn’t want to embarrass anyone. Then followed a brief game of Paper, Rock, Scissors, Lizard, Spock. Well, that’s how I choose to remember the decision making process. I then ‘volunteered’ to become the script writer. Let’s be clear, I’m not a great reader and I never dreamt of being a writer; this was a new, unexpected and unsought challenge. To that end, I closeted myself away in the second half of October ’18 and wrote the 12 Episodes that make up Season 1. I have to say, it was strangely pleasant! However there was an obstacle. Even with the suspension of belief that many fiction writers rely on, there was no way that Sydeline could adequately serve our purpose and financially survive the first 3 episodes, let alone the first season! We had to hatch a cunning plan to solve this issue, which is the subject of Episode 1. We did have to come up with a name for our podcast, of course. To do this Mike and I drew on years of hideous experience. To explain, if you’ve been a regular frequenter of business meetings, you may well have enjoyed a game of Buzzword Bingo (unfortunately insecure website). One phrase that may well make it into such a game is “Blue Sky Thinking”. 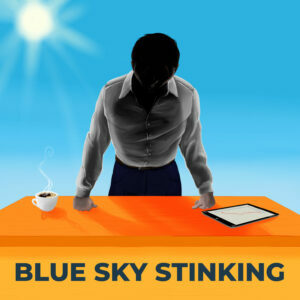 Blue-Sky Thinking is ‘the activity of trying to find completely new ideas.’ (Collins). 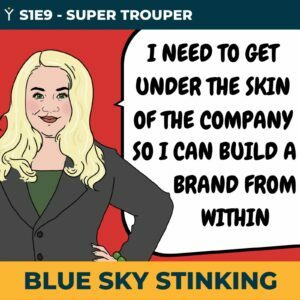 But, what happens if, as part of striving for a new, great idea, you stumbled onto a rancid idea and then carried on with it… that would be Blue Sky Stinking. So, the name was selected but Podcasts need artwork to attract listeners and to stick out in the crowd. We gave that challenge to our artist in residence, Harriet Teagle. Harriet created our Cobot mascot and quickly put her hand to creating the original artwork. During Harriet’s busy December season, not only did we get a striking piece of album art, but she also managed to put a face to each of the major characters. Can’t thank her enough for that. 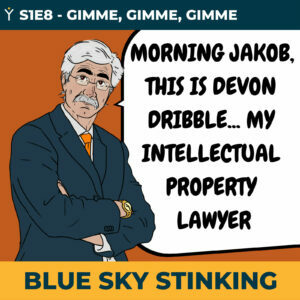 On the back of Harriet’s inspiring interpretations of a scant brief, we have been able to put together some great episode art. You can see some of these are the bottom of our home page. The concept of the Podcast is to appeal to people new to, or currently, running a business. 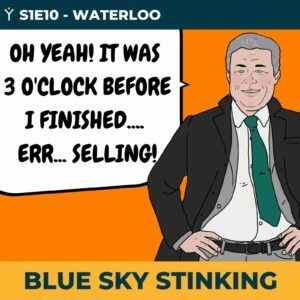 Each episode starts with a fly on the wall snippet from the life of the Sydeline company. Following, what we hope is, a humourous snapshot of events, Mike and I, seek to unravel the issues raised and provide advice and guidance on related matters. Assisting us, a range of expert guests will help to delve into certain topics over the weeks. However, before we get to dishing out the helpful stuff, we had to find a cast. We needed help to play an array of characters to avoid the Gydeline team being forced into acting duties. Enter the Camhayle Theatre Group, a local dramatics organisation with the abilities we needed. Unfortunately, we were perilously close to the ‘festive season’ and Camhayle had a production on the go. We had to wait until 2019 rolled into place and we started casting. It was an odd experience for a first-time script writer to hear different people voice the characters you’d only heard in your head. Each person providing a unique approach and style for the various personalities we’d constructed. The feedback on the script was comforting and unexpected… hmmm, maybe I can write! At last! A cast was selected and the date was set. We’re going to record the first 6 episodes in one sitting… but where? I’ve recently had the privilege of moving into a wing of a notable 18th century house in Lostwithiel, Cornwall. One of the greatest attractions of the house is the impressive brick vaulted cellars, which carries an amazing history. Another day’s story perhaps. This beautifully built venue provides the ideal environment for single microphone recording, reducing echo and reverberation. All I had to do is hang a microphone on a 270 year old brick ceiling… hmmm, Sarah, my wife, was not impressed with my first drill-based ideas. A rudimentary, but dare I say, impressive and non-damaging wooden framework came into being. Phew! The microphone is nothing fancy. A fairly basic suspended condenser mic with, as it ended up, an unused pop-guard. One USB connector into Mike’s MacBook Pro and recording on Apple Garageband and we’re away. The cast had practiced and developed their own take on each of the characters. The first 6 episode’s scripts were recorded in a matter of hours. A few stumbles later and various retakes to get the interaction and intonation spot on, and we are good to go. The next stage awaits, mixing it down for broadcast. We are now doing the post-production work on the first few episodes for release in February. Not wanting to damage the illusion, but I have kinda given the game away, we’ll add background noise and soundFX. Maybe even some music as a bed, once we get the licence! 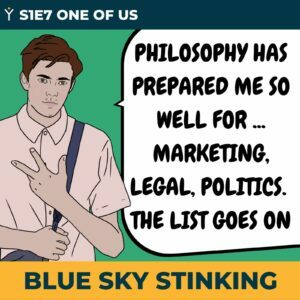 So, sign up in preparation for the Blue Sky Stinking Podcast release and please tell us what you think. Oh… and if you enjoy it, please share the article on your platform of choice.